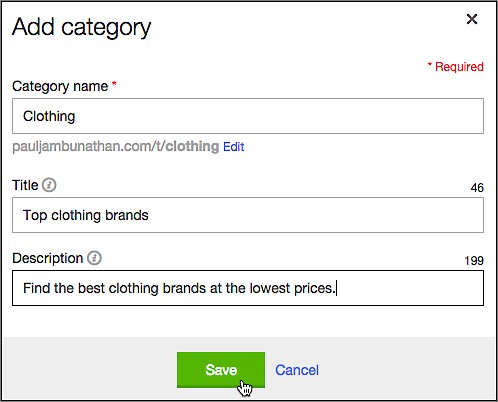 Help your customers quickly find what they need in your Shop by creating product categories. If a particular category has lots of products, consider creating subcategories, such as Clothing: Women's, Men's and Children's. You also can rearrange categories so the most popular ones are listed first. Note: Main categories can only have two levels of sub-categories. So "Clothing > Women's > Shoes" would work but "Clothing > Women's > Shoes > Sandals" would not. From the Products tab, click Categories. On the Categories page, click Add category. Enter a Category name, plus an optional Title and Description. Note: While only the Category name is required, filling in the Title and Description fields helps customers find you through search engines like Google®. For example, if in the Title field you add keywords commonly associated with that category, it increases the likelihood that customers searching with those keywords will find your pages. Your Description appears in search engine results summarizing your category. A quick-to-scan description of your category's specific features can help grab customers' attention. After creating categories, you can easily change or delete them as needed. You also can turn a category into a subcategory or rearrange them as you like. Change a Category Click the pencil icon next to the category you want to edit. Delete a Category Click the trash icon next to the category you want to delete. Click OK when asked to confirm your action. Turn Category into a Subcategory In a single motion, click and drag an existing category under, and to the right of, what will become its parent category. Rearrange Categories Click on the left-hand dotted box of a category to drag and drop it above or below another category. Why can I not change order of products in a category?